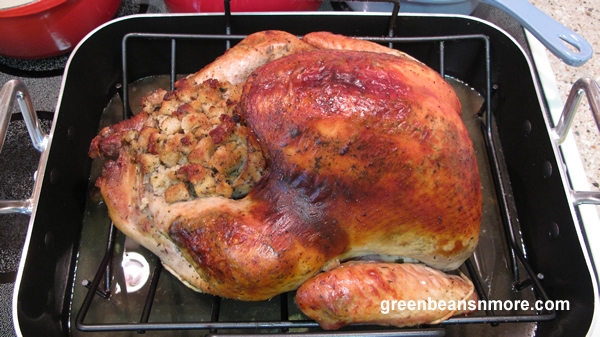 Here's a picture of our beautiful browned moist and flavorful turkey. Cooking a turkey like this isn't as hard as it seems. After you've done it just one time you'll feel like an expert. These tips on how to cook a turkey will help you do it like a pro the first time! Experts suggest allowing 1 to 1 1/2 pounds per person. How long will my frozen turkey need to defrost? A frozen turkey will need to be defrosted in the refrigerator. The rule of thumb is 24 hours for each 5 pounds. This means a 20 pound turkey will need 4 days in the refrigerator to defrost. Remove the giblet's from the cavity of the turkey. Giblets are the turkey's neck, gizzard, heart and liver. You'll want to add these giblets while making your turkey stock . Once they're cooked you can chop them and add them to the gravy and stuffing for extra flavor. Rinse off the turkey. Rinse it under cold running water, also washing out the cavity. Pat it dry outside and inside with paper towels. Also rinse the giblets. Wash any surface that comes into contact with the raw juices very carefully to help prevent cross-contamination. How do I choose a roasting pan for the turkey? A metal roasting pan is much safer than a disposable aluminum one. If you must use a disposable aluminum roasting pan be very careful moving it in and out of the oven as it could possibly collapse. Don't crowd the turkey into the roasting pan. Make sure the roasting pan allows for at least 2 - 3 inches of air space all around the turkey which helps to insure even cooking and browning. How much stuffing will I need to stuff the turkey based on it's weight? You'll need 1/2 cup to 3/4 cup per pound of turkey. Don't overstuff the cavity with the stuffing as it needs to expand as it cooks. If you have extra stuffing cook it on the side in a baking dish. How can I be assured of a beautiful browned and flavorful turkey? butter mixture directly onto the meat. Also, slather it all over the turkey skin before you put it in the oven. How often should I baste the turkey? This is often debated. Some "experts" say that basting makes no difference in regards to moisture of the turkey. Today a lot of frozen turkeys are "self-basting" which means they don't need basting. Also, every time the oven is opened the temperature goes down, which can add a few minutes to the cooking time. I baste every 20 or so minutes once the foils comes off and do it quickly to help prevent too much heat loss. Should I cover the turkey with aluminum foil while it's baking? Yes, keep the turkey covered with aluminum foil for 2/3 of the cooking time. What temperature should the turkey be when it's done? Temperature is important in determining if turkey is properly cooked. The thigh temperature should be 175 degrees and the stuffing 160-165 degrees. Make sure the thermometer you're using is not touching bone when you take the reading. If it's a degree or two under that's OK. As the turkey rests tented with aluminum it will rise a degree or two. How long should I let the turkey rest after I take it out of the oven? When you remove the turkey from the oven place it on a platter and tent it with aluminum foil. Let the turkey rest between 20 and 30 minutes before carving. This is the perfect time to start your Madeira gravy using the dripping from the turkey. Use the timetables below to determine how long to cook your turkey. These times are approximate. Always use a food thermometer to check the internal temperature of your turkey and stuffing. The thigh temperature should be 175 degrees and the stuffing 160-165 degrees.